In 1907, while prospecting his claim on The Mainland at Lake Austin, Harry found it necessary to sink a shaft. He was at a depth of 10 feet and needed to use explosives to blast through some hard rock. He bored a hole into the earth for the purpose of “shooting the ground” when he noticed the leg of a frog (often referred to as a toad in the newspapers) hanging out of some loose red clay. Fetching his pick, Harry carefully dug the frog out. For a few minutes it showed no signs of life. Then, it opened its eyes. …he opened his eyes, which I noticed were quite transparent, with no pupil. After about five minutes’ breathing a small black stroke appeared across the eye, like a cat’s at midday. Then gradually it assumed a round condition, until it became a pupil of normal size, which has remained so. Curious as to how the frog ended up so far underground, Harry felt around in the cavity where it was found. There was no point of entrance and it was surrounded by dioritic slate and hard cement. Due to that fact Harry theorised that the frog may have been entombed for hundreds of years. The chamber is perfectly smooth in which he was entombed, and there was no vacancy around him for movement. Feeling as though what he had found was an important scientific discovery, Harry took the frog back to his home at Day Dawn and on 21 July 1907, he wrote a letter to Lance Le Souef who was secretary of the Acclimatisation Society. Both the letter and the frog were sent to the Zoological Gardens in Perth. It was described as being dirty brown in colour and had seven dark yellow lines running the length of its back. Lance refused to speculate on its age but admitted that frogs were known to bury themselves in mud and remain buried until rainfall reanimated them. Despite Harry’s well-articulated letter, there was some doubt as to the legitimacy of the story. Could it simply have been an elaborate scam? Others however had their own entombed amphibian story and William Kerr was one such person. He shared his story in a letter to the editor. The frog soon became a source of inspiration with poetry being the popular mode of expression. ‘Needle’ wrote for The Daily News and composed several silly poems including the following ode to a toad. Lance Le Souef continued his investigations amidst growing public interest. How old was the frog? Hundreds of years old? Thousands of years old? Sensing an opportunity, on 27 July 1907 it was announced that the frog would be put on display at the Zoo. This inspired ‘Needle’ to write another humorous poem. Due to the rainy weather, the afternoon of Sunday, 28 July 1907, saw a reduced number of visitors at the Zoological Gardens. The frog however received “considerable attention” from those who were present and, according to Mr Le Souef, was “getting quite lively and hungry.” It appears to have been the only day the frog was put on display and the only opportunity for the public to see it. The problem of its identity and history, and the secret of its existence; is not to be lightly put aside. What became of the frog afterwards is not known. The Evening Star (Boulder) claimed in their article that Mr Le Souef intended to examine its organs, which surely meant that it would be killed. On the other hand they stated that it may be placed in clay in the hope that it would again become inanimate and that Mr Le Souef would then attempt to reanimate it. Neither option sounded particularly positive for the frog. In early August 1907 the frog was still the topic of discussion. Similar frog finding stories were continually shared and it caused The Daily News to become sceptical, stating tongue-in-cheek that, “The marvellous ‘entombed toad’ grows more marvellous day by day.” They suggested an experiment to prove these stories; place a frog in a hermetically-sealed vessel and record what happens. The Western Mail also continued with the story however they went further and had a photograph taken. The squat, plump frog was featured in their illustrated section and provides us with the only known image of it. Discoveries of entombed amphibians were known to have occurred in other countries around the world and the fascination for them was likely because they appeared to survive for a long period of time without sustenance. No one knew why or how and the lack of answers made the tales intriguing. New stories were therefore picked up and reported on with gusto. As the news died in Western Australia, UK and US newspapers began reporting the story, some a little more exaggerated than others. So what is the truth behind the frog found in a hole at Lake Austin? Thanks to Harry’s description and the photo printed in the Western Mail, the frog has been identified by the Western Australian Museum and the Perth Zoo as a burying frog, most likely the commonly known plonking frog. These frogs are found in arid conditions and tend to breed in temporary water bodies. Before the ground becomes too dry they burrow underground and commence aestivation (dormancy). During aestivation they continually shed their skin to create a cocoon that surrounds their body and helps them to preserve water. They remain dormant underground until the rainy season wakes them up again. Plonking Frog on the Western Australian Museum website. How long was it underground? Far from the hundreds or thousands of years reported in the newspapers, the frog was likely buried for, at the most, a year or two. Perhaps it had only just dug itself underground when it was found by Harry Ainsworth. While their abilities are remarkable, it is very unlikely that the frog was hundreds of years old. Nor was it 6,000 years old as some US newspapers ridiculously claimed. The popular superstition that frogs can exist for hundreds of thousands of years in a state of suspended animation has not a particle of carefully ascertained scientific fact to rest upon. The frog probably remained in Perth and was most likely researched to increase scientific knowledge of amphibians. Harry meanwhile returned to mining at Lake Austin. He never found another El Dorado. A year later he fell ill and was taken to hospital in Geraldton. His illness was terminal and he passed away on 1 July 1909. Despite all that he achieved throughout his life some eulogies tended to focus more on the riches he lost and the frog that he found whilst trying to reclaim them. Harry Ainsworth circa 1897. Courtesy of the City of Greater Geraldton Regional Library (P 1049). State Library of Western Australia; Map of the Central Goldfields [cartographic material] : including parts of Murchison, East Murchison, Yalgoo & Peak Hill G.Fs. ; Call Number: 9022.M95H2 (http://purl.slwa.wa.gov.au/slwa_b2247326_2). Photo of H.S. Ainsworth courtesy of the City of Greater Geraldton Regional Library (P 1049). “Multiple News Items.” Penny Illustrated Paper and Illustrated Times [London, England] 31 Aug. 1907: 139. British Library Newspapers. Web. 13 Mar. 2019. Information on the frog courtesy of the Western Australian Museum via email and online (http://museum.wa.gov.au/explore/frogwatch/frogs/water-holding-frog). 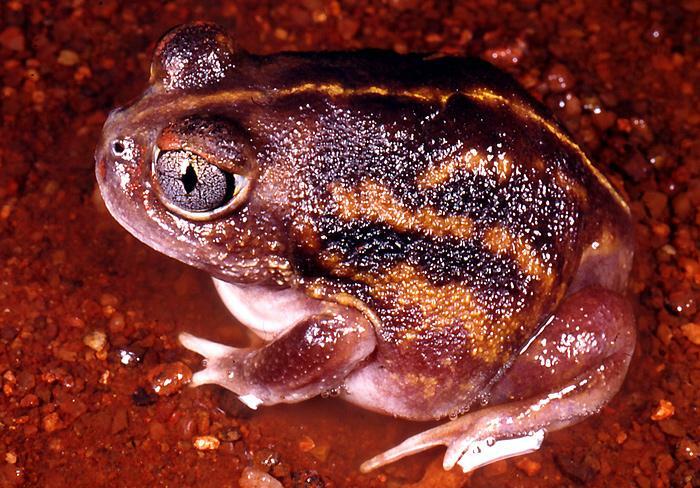 With thanks for the Perth Zoo for the information and identification of the plonking frog. That was fascinating about the frog. That is fascinating. I’m amazed the frog survived being dug up and transported like that. Thanks Stella. So am I! Was not a short distance by train back in those days. Good yarn. They took simple things seriously back then. Letters. Poems. I wonder if Harry left a family? Thank you. They certainly did! It makes for fascinating reading for us. He was survived by his wife but I don’t believe they had any children. Fascinating. I wonder if Harry left a family. They took minor incidents seriously. You’re welcome, Jess, totally fascinating. Intrigued by this story….my husband actually dug up a frog in the hard red dirt around Lake Goongarrie, WA, a few years ago. It was about 20cm deep and we were astounded at it’s survival in such a harsh environment. They’re amazing aren’t they! I had no idea such frogs existed so I’ve definitely learnt something new by writing the story. Thanks for the comment, Marylyn.